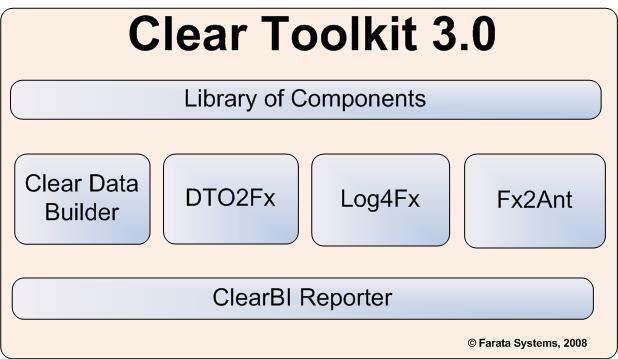 Clear Toolkit 3.0 is a set of components, code generators, and plugins created by software engineers of Farata Systems that we were using internally in multiple Flex enterprise projects. In September of 2008, we’ll release its private beta. This toolkit will be available free of charge. Components library is an swc file that includes a number of enhanced Flex components like Datagrid, ComboBox et al. Clear Data Builder 3.0 is an Eclipse plugin that allows to generate CRUD applications for BlazeDS or LCDS based on an SQL statement or a Java data value object. Log4Fx is an advanced logger (Eclipse plugin) that is built on top of Flex logging API but automates and make the logging process more flexible and user friendly. ClearBI 3.0 is a Web reporter for smaller businesses. It includes an AIR-based report designer and flexible report generator that can be used by IT personnel as well as end users. This entry was posted in Data Services, Flex and tagged Add new tag, Flex by Yakov Fain. Bookmark the permalink.